Mice are small rodents found most parts of the world. They are generally members of the Mus genus, although the term “mouse” can be applied to a variety of similar rodents. Wild mice are often considered pests or vermin. They may spread disease, damage crops and food, and cause structural damage. 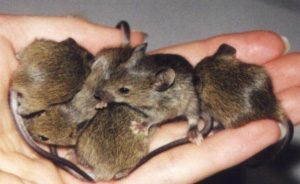 Domestic mice are often kept as pets or used in laboratory studies. House mice have an adult body length (nose to base of tail) of 7.5–10 cm (3.0–3.9 in) and a tail length of 5–10 cm (2.0–3.9 in). The weight is typically 10–25 g (0.4–0.9 oz). They vary in color from white to grey to light brown to black. They have short hair and a light belly. The ears and tail have little hair. The hind feet are short compared to Apodemus mice, only 15–19 mm (0.59–0.75 in) long; the normal gait is a run with a stride of about 4.5 cm (1.8 in), though they can jump vertically up to 45 cm (18 in). The voice is a high-pitched squeak. House mice thrive under a variety of conditions: they are found in and around homes and commercial structures, as well as in open fields and agricultural lands. This entry was posted in Laboratory Mice.